I’ve decided I’m my most creative with food when there’s very little food in the house. Crazy or logical? Maybe it’s a little bit of both? OK–so, what’s a girl to do other than the traditional scrambled eggs and bacon we have almost every morning… Eggs over hard? YES. Roasted red bell pepper on the side? Sure! What about those yummy avocados… I can’t resist. To make them work harmoniously, I just threw in some spices. 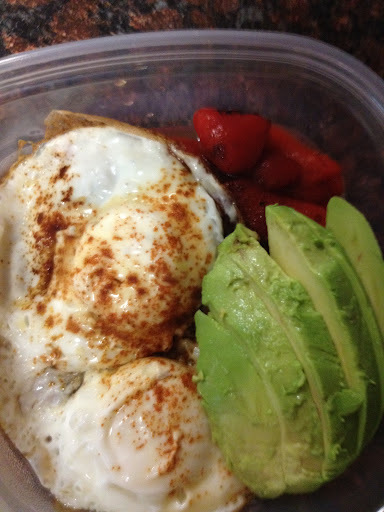 Place the roasted bell pepper on a plate (or in your plastic container, like I did, if you’re planning to carry this to work). Sprinkle some ancho chili and chipotle chili powder over it. 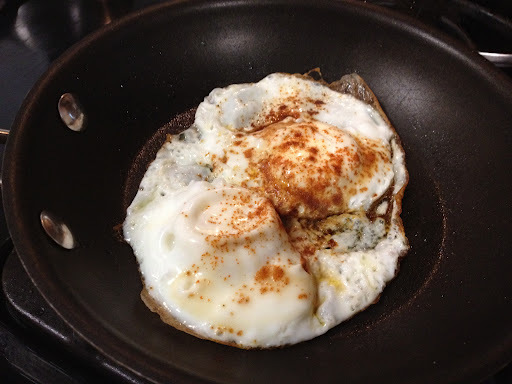 Melt the ghee in your pan over medium-high, then crack your two eggs into it and fry those babies up! 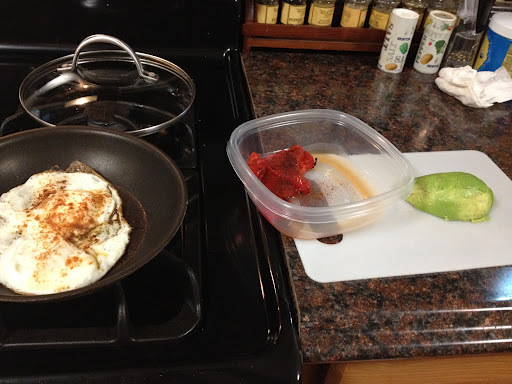 Within the first minute of them cooking, sprinkle some salt, pepper, ancho chili powder and chipotle chili powder over the eggs. Note: If you’re like me and you prefer sunny-side up with a fully cooked yolk, let the eggs fry for a couple minutes on medium-high, then turn the heat down to low, cover and let cook for about 10 minutes. 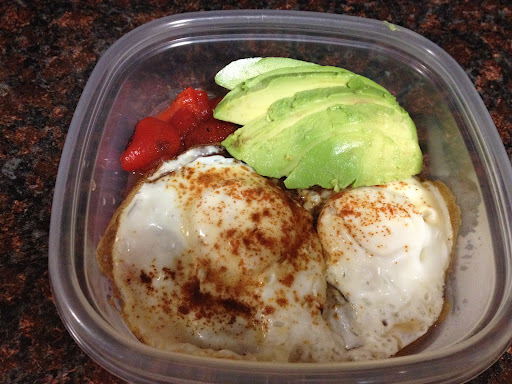 Once the eggs are done, simply add them to your plate or container.